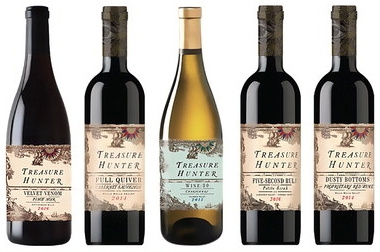 Treasure Hunter wines has developed one of the largest cult followings of any label in the United States. Founded in 2007, Treasure Hunter quickly caught the eye and imagination of wine lovers who were thirsting for something different and fresh. This is not necessarily an easy thing to accomplish in the wine world, as the nature of the business is to establish brands with a consistent style and level of quality so that consumers know what to expect when they pull a bottle off the shelf. Treasure Hunter’s approach is quite different as explained by co-founder Hunter Vogel. The practice of making negociant wines is centuries old and is still quite prominent in Europe, especially France. There are a significant number of negociant winemakers in the United States, but none have captured the hearts and minds of wine lovers like Vogel and his partners Andrew Lerner and Mike Loykasek. Treasure Hunter essentially buys large barrels of wine from a winery, transports it to its facility in Geyserville, Calif., where it is finished and bottled under the Treasure Hunter label. When a wine hits the market, there are only a finite number of bottles available. Once they’re gone, they’re gone, and the wine won’t be made again. Treasure Hunter’s business has expanded greatly since 2007 as their popularity has grown. They make wine under several other labels including Kit Fox, Treasure Cellars, Gunfighter, One Time Spaceman and others. Loyal customers often arrive at retail shops the same day the wines are released to insure they get their bottles. Treasure Hunter also has a local connection. Valley businessman Tony Bellatto partnered with Treasure Hunter to launch Viva La Vida Rose Cava in 2016. Bellatto traveled to Spain with Vogel and his partners, tasted samples from more than 100 vineyards and eventually selected vineyards in Penedes, Spain, as the source to make the Spanish bubbly. The launch of Viva La Vida was chronicled in the April 27, 2016, edition of The Vindicator. Wine:30 Chardonnay – Ancient Lakes, Wash.
Well balanced with flavors of pear and tangerine finished with cream and a hint of vanilla. This is Treasure Hunter’s first Chardonnay from Washington State. Velvet Venom Pinot Noir – Rattlesnake Hills, Wash.
Aromas of cherry, cola, milk chocolate and spice with hints of fresh-baked ham. Silky on the palate with flavors of blackberry and freshly roasted coffee. Five Second Rule Petite Sirah – Alexander Valley, Calif.
Lush and bursting with fresh picked strawberry, blackberry, and cassis intertwined with cedar, smoke and hints of baking spices. Full Quiver Cabernet, Walla Walla, Wash.
Black fruits with currant and fig jump from the glass and entice the palate. The fruits mingle with French vanilla and pipe tobacco on the finish. Deep and rich with a finish that lingers. All of these wines should be available at your better local wine shops and some local restaurants. Keep an eye on www.threefingerwine.com to keep up with current releases.